Our enrichment programs begin in the classroom for all grades, and continue into after school programs. We have quality instructors, other than the classroom teachers, teaching art, music, physical education, technology, and Spanish. These classes are taught during a specific time slot during the day in grades K-6. Our music instructor, parent JoVonne Bolt, studied piano for twelve years, singing in college choirs, and playing in jazz bands. JoVonne brings a passion for teaching and music, while fostering that same love of music in our students. Her goal is to bring basic music literacy to each child while having a ton of fun! Much of JoVonne's creativity and work with the students can be seen during our Spring and Christmas programs. Our Spanish teacher, and parent, Celia Marr teaches foundational and 'hands-on' weekly Spanish classes to grades TK to 6. Students are actively engaged in learning Spanish through songs, games, dance, art, and thematic units integrated into the curriculum. The emphasis is on recognizing, understanding, and pronouncing Spanish characters, common phrases, and basic vocabulary; learning about Hispanic culture, its history and traditions; and improving conversational skills. Our technology instructor, alumni-parent Lori Kraemer, uses the curriculum by Structured Learning. Students learn technology that promotes literacy, critical thinking, problem-solving, and decision-making through the age/grade appropriate curriculum. By the end of 5th/6th grade, students have mastered keyboarding (30 wpm), software programs like Excel, Microsoft Word, PowerPoint, and Publisher, and computer basics such as hardware, Windows, computer etiquette, internet, blogging, and Google Earth. Dennis Bolt and Kerri Green, parents at PHCS, teach a weekly art class to all grades. Dennis is a graphic artist, designer, photographer, and fine artist, with a degree in Architecture. Kerri is an artist, writer and blogger. The weekly classes focus on appropriate lessons for each class level, with an equal amount of art history, art technique, and seasonal craft. All classes have PE twice a week, taught by classroom teachers and parent Joy Dehnert. In 2018 we are using a new SPARK PE curriculum. We encourage all of our students to be active in school and at home. 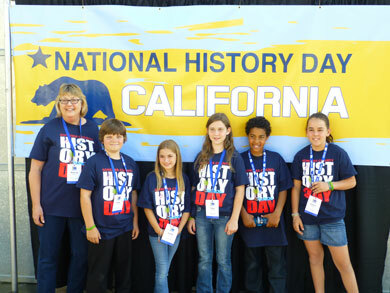 Each school year our 5th and 6th graders participate in National History Day. The students work hard researching a history topic of their choice and then develop a project (exhibit, performance, documentary, website, or poster) which ties their topic into the History Day theme. All the students participate at the school level and many go on to compete at the county and state levels. It gets very exciting as their projects (and research and knowledge) get better and better at each level and it's great to see the kids get keyed into history and the significance of their particular topic on the world today. Most PHCS student compete at this level. Many PHCS student move on and compete here. Two PHCS projects have won at State level and competed in Washington DC in the last 5 years. We are immensely proud of our students for consistently winning at the County level, and going on to represent Sonoma County at State History Day competitions. Recently our students have won in their categories at State, and have gone on to represent California at the National level! See PHCS 6th grader Drake Bolt's 4th place National level winning website from 2016. Get more info and handouts on Ms. Kinser's page. Each year the kids put on several music and drama productions. A Christmas musical program and Spring dramatic program are highlights of their extracurricular education. Click here for video. Students in first through sixth grades have an opportunity to develop their public speaking skills by participating in Speech Meet. Students are chosen from each grade level in the areas of poetry, fables, Bible, and memorization to compete at the local level. Each student must participate at the classroom level, but continuing to the local level is voluntary. At the end of each school year, we have an all school science fair where each student from second to sixth grade displays a project which shows their knowledge of the Scientific Method. Our first graders put together a collection. All projects for first through fourth are displayed for visitor viewing in the front hallway. The fifth and sixth graders alternate each year between an experiment and an invention, and present their projects to visitors walking through the fair during a designated time. Visitors are encouraged to interact with the students in order to allow students to communicate what they have learned from the project. Accurate spelling is an important part of the communication process, and to help develop that accuracy, our students in fourth through sixth grades participate in an annual Spelling Bee competition which continues to the county level. The top two spellers, regardless of grade, move on to the Sonoma County Competition. Competitors at the county level come from all schools, both public and private, in Sonoma County.